Cherrim in game: 199 Who? Important notice! Pokemon Cherrim is a fictional character of humans. Cherrim (Japanese: ???? Cherrim) is a Grass-type Pokémon introduced in Generation IV. It evolves from Cherubi starting at level 25. Cherrim changes appearance in sunny weather. Cherrim is a small Pokémon with two different forms, both of which are dependent on the weather. During normal weather conditions, Cherrim is in its Overcast Form. Two purple petals enclose its deep pink body. A short purple stem and a green leafy sepal sprout from the top of the petals. Its eyes appear to be near its short legs in this form. When there is strong sunlight, Cherrim is in its Sunshine Form. Pink petals similar to cherry blossoms surround its head and cover its chest. Several of the petals radiate outward from a yellow sphere on the back of its head. There is a small, triangular patch of green on its neck. 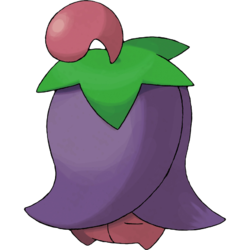 Additionally, two berry-like orbs, resembling cherry-shaped hair ornaments, adorn its head. It has stubby limbs, with the arms being pink and the legs being yellow. Cherrim waits quietly as a bud for a ray of sunlight. 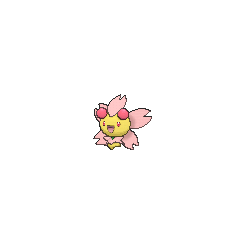 When it is hit with strong sunlight, it blooms and absorbs the rays with its entire body. It quickly changes from quiet to excitable and active. It will attempt to make up for everything it had to endure as a bud while the sunlight lasts. Once the light is gone, Cherrim folds back into a bud. Cherrim made its debut appearance in the anime in Battling the Generation Gap! under the ownership of Lila, a famous Pokémon Stylist. It was used in the Performance Stage of the Celestic Contest when Lila decided to enter a Contest again, remembering her days as a Coordinator. A Cherrim was among the Grass-type Pokémon attempting to save an old tree in Promoting Healthy Tangrowth. 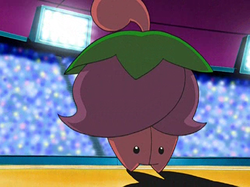 Cherrim made its first appearance in the movie The Rise of Darkrai, where several of them appeared. Three wild Cherrim appeared in The Lonely Snover!. Multiple Cherrim made a brief appearance in Coming Full-Festival Circle!. 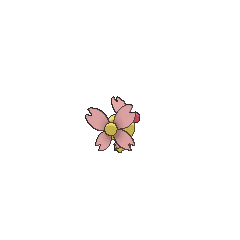 DP095 Cherrim Ash's Pokédex Cherrim, the Blossom Pokémon. Cherrim stays quiet until its flowers bloom when it becomes quite excitable. 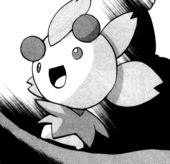 In the Pokémon Adventures manga, a Cherrim in its Overcast Form first appeared in the Seven Stars Restaurant under the ownership of one of its customers. Platinum received a Cherrim from Gardenia during the climax of the Diamond & Pearl chapter. When escaping the Distortion World in the Platinum chapter, Platinum's Cherrim changed to her Sunshine Form. Moves marked with a superscript game abbreviation can only be bred onto Cherrim in that game. 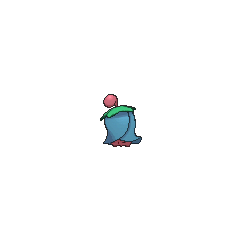 For other sprites and images, please see Cherrim images on the Bulbagarden Archives. 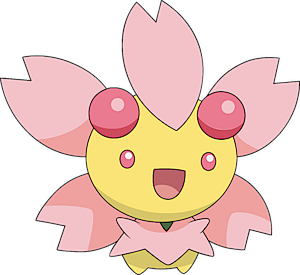 While Cherrim's forms are called Overcast Form and Sunshine Form in English, the Japanese names of its forms use ?????? form, which is otherwise only used in the names of forms which are localized as Forme. 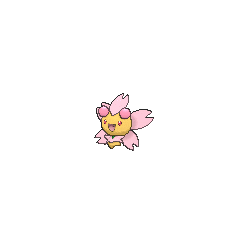 Cherrim and Castform are the only Pokémon whose alternate forms cannot be viewed in the Pokédex in Diamond, Pearl, and Platinum. Only the Overcast Form and its gender differences (though it has none) are available, but it is not labeled as such. It appears that Cherrim's reaction to light is based on photonastic flowers. 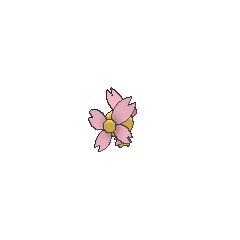 Cherrim Sunshine Form seems to be based on cherry blossoms, flowers that are particularly symbolic of Japan. Cherrim is a combination of cherry and cherubim or blossom. It may also involve cherimoya (a fruit-bearing tree) or tirim (Irish for dry, as in dry weather). Japanese ???? Cherrim From cherry and cherubim or blossom. May also be from cherimoya (a fruit-bearing tree) or tirim (Irish for dry, as in dry weather).